FLOODING at Greenvale, La Horquetta not only unearthed the need for proper drainage in that community but also illegal squatters, according to the Housing Development Corporation (HDC). 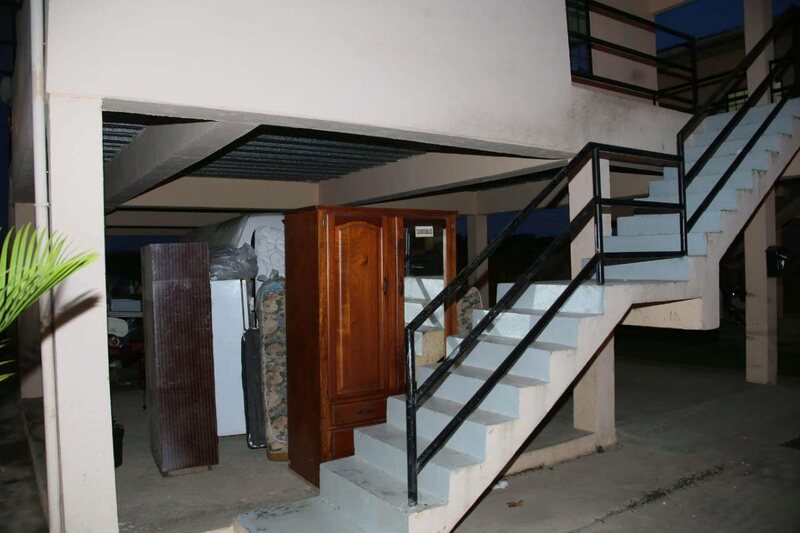 Speaking with Newsday yesterday, officials said a couple and their two children were discovered to be living in a unit at Alpha Avenue without authorisation, for over a year. The couple, Atiba and Natasha Sorzano, were evicted yesterday. Natasha told Newsday that last Saturday they were told their HDC documents were fraudulent and they needed to visit the HDC in Port of Spain on Monday. When they went to the HDC, they were told to leave the house by yesterday, otherwise they will be evicted. As promised, while at their attorney’s office, HDC officials removed the family’s belongings and placed it under what was once their home. Natasha said the family lived at Welcome Village in Cunupia and moved out because of constant flooding and their Venezuelan landlord needed his home since he was migrating to TT. Desperate for a place to live, they visited the HDC seeking help as Atiba had an application on file. They met a man whom they identified to Newsday, who offered to help. The man, Natasha claimed, fast-tracked her husband’s application and soon after they were given keys to unit 179 Alpha Avenue, Greenvale Park, La Horquetta. “We thought everything was okay and he was helping us because people in HDC was saying he is a nice man and does help people. He gave us some documents and when we asked about payment, he told us to put aside the money because all the paperwork wasn’t ready. “He gave us documents to get the light bill in our names and a letter to take to the police because the keys we get was not working and we had to break in,” Natasha said. The Sorzanos and their sons, aged nine and seven, moved in on August 12, last year. They have not paid any money to either the HDC or any financial institution and are adamant they did not pay the man who helped them get a home, neither anyone else. She said the family went to the La Horquetta Police Station with documents reportedly from the HDC authorising them to use force to enter the house and were welcomed to the neighbourhood by the officers. Atiba, a maxi driver, is part of the community’s neighbourhood watch as their home, an elevated single unit, was the type that thieves preyed on. However, in an interview with Synergy talk show host Harvey Borris yesterday, Atiba claimed they did receive an allocation letter from the HDC for a unit in Greenvale, but never received further communication from the corporation and only dealt with the man until they were evicted. According to the HDC, last Saturday, officials met with the couple who could not validate their tenancy. The HDC became aware of the illegal occupancy when officials went to Greenvale to set up a recovery centre in the community to help assist flood victims. During that period, they realised a house was occupied while it was not supposed to have been. Although the house is elevated, the couple told Newsday that they received $20,000 in flood grant from the Ministry of Social Development in two $10,000 tranches. HDC officials told Newsday that the house the couple lived in, was not affected by the flooding. HDC officials told Newsday that they as well as the Social Development Ministry gathered information on affected residents and the Sorzanos were not on any list for grant relief. Calls yesterday to the Minister of Social Development Cherrie-Ann Critchlow-Cockburn went unanswered and messages were not returned up to press time. HDC managing director HDC Brent Lyons told Newsday that illegal tenants were discovered during “routine checks”. He added that “we will ketch everybody”, stating the system in place will weed out all those who are illegally occupying houses. He said the penalty for occupying the houses without permission is a $200 fine under the Sum­ma­ry Of­fences Act, sec­tion 45 (c) for loitering. The Sorzanos insist they were hoodwinked pointing out that they received official documents which allowed them to have utilities in their name which they have been paying. Reply to "FLOOD FRAUD UNCOVERED"